Every pond owner will have to deal with algae at some point, and there are lots of opinions on how it should be eliminated or managed. While some will recommendwater testing andman-made products, another alternative to controlling algae naturally is through barley straw. When barley straw is placed inside water it will begin to break down, and a chemical will be released which will inhibit algae growth. The breaking down of barley straw is a process that is microbial, and as such is heavily dependent on the temperature of the surrounding environment. Its chemical release will occur more rapidly during summer, but will be slower in winter. This means that initially the algae may not appear to be affected by its presence, but after a certain number of weeks have passed it will be diminished.Research is ongoing on the exact mechanism which barley straw uses to control algae, but the one thing that everyone agrees on is that it works. However, there are a number of things pond owners should consider prior to purchasing and using it. Barley is one type of straw that can be used to control algae, but there are others, such as linseed, lavender stalks and wheat. These can be used as alternatives to barley straw in the elimination of algae, but will not be as effective nor will they function for the same period of time. If barley is unavailable and you decide to use one of the alternatives, the quantity and application frequency must be increased. Hay should never be used to eliminate algae because it will instead do the opposite, releasing nutrients that will encourage its growth. How Much Barley Straw Should Be Used? The amount of barley straw that you should add to your pond depends on the water’s surface area. The volume of water in the pond is not important, largely because most algae growth occurs on the surface of the pond. 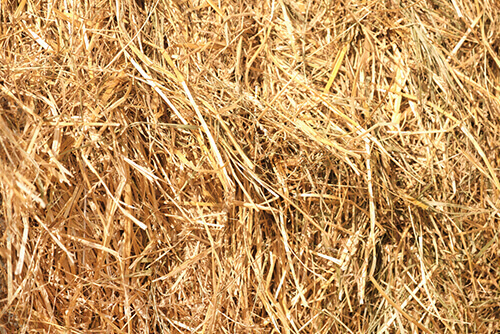 The minimum amount recommended is about 10g of straw per m2 of surface water. However, if your pond has a history of algae issues larger amounts may be needed. As the algae present begins to subside, the barley straw being applied can be reduced accordingly. Pond water which is muddy will require more barley straw than that which is clear. Some experts have raised questions about the point at which the barley straw itself could become a problem, the result of microorganisms colonizing it and then absorbing the water’s oxygen, as well as the chemical pressure which results from the straws break down. However, the decomposition of straw occurs very slowly and the usage of oxygen by microorganisms won’t cause any problems unless huge amounts of straw are used, such as 100g of straw per m2 or greater, which is far more than most pond owners will ever need.